With the grip of climate change tightening around the planet, few seem to understand the urgency of the climate crisis we are facing. This is why the announcement on 1 September of over 3500 churches in the UK switching to clean, green power is so significant. At last, a solution is presented by religious communities that matches the scale of the problem. At last, they are providing the kind of leadership for the needed transition to an ecologically sustainable future. Dubbed the Big Church Switch, around 2000 parishes from 16 Catholic dioceses are switching entirely to renewable energy. The dioceses made their decisions following the publication of Pope Francis' environmental encyclical Laudato Si', and made the decisions public on the day named by Francis as a World Day of Prayer for the Care of Creation. The number also includes the majority of the Salvation Army's UK sites, a third of Britain's Quaker Meeting Houses and hundreds of Church of England, Baptist, Methodist and United Reformed Church parishes. They have signed up individually through the bigchurchswitch.org.uk website promoted by the charities Christian Aid and Tearfund. If actions speak louder than words, the announcement is a whole-hearted shout. For decades, formal statements issued by prominent religious leaders have quietly but unmistakably been charged with a sense of urgency. Francis wrote, for example, 'Doomsday predictions can no longer be met with irony and disdain'; and that 'Politics and business have been slow to react in a way commensurate with the urgency of the challenges facing our world'. The majority of climate scientists would agree. An extraordinary number of extreme weather records have been set in the last year, with 2015 the warmest year on record by a significant margin and 2016 set to beat that record. Globally, this July was the warmest month ever. It is no coincidence that Cyclone Winston, which battered Fiji in February, was the fiercest Pacific storm system ever to hit landfall. Credible advocates such as Ian Dunlop, former head of the Australian Coal Association, are promoting the term 'climate emergency' to reflect the seriousness of the threat. "The majority of faith-based organisations in Australia continue to have investments in fossil fuel extraction and it remains a minority of them which are using clean energy." Until now, some of the best examples of the churches providing real leadership have been decisions by over 200 faith-based organisations to divest from fossil fuels and/or reinvest in low carbon technology. Decisions by the Lutheran World Fellowship and four Australian Catholic religious orders were the most recently publicised. With falling returns from coal, oil and gas extraction, the costs of these actions have not been financial but in the time and effort involved. The obvious question for us in Australia is: does the present scale of action by faith-based organisations here match the urgency and scale of the problem? It is true that Australian churches were among those who led the way when the fossil fuel divestment movement began. The Anglican and Uniting Churches promoted divestment at a national level, and their sub-national bodies passed resolutions to divest from fossil fuels. Decisions by other churches and the Quakers have followed. It is encouraging that there are many hundreds of people of faith who are active in the political process. We can also take heart that a sizable proportion of the tens of thousands at the People's Climate Marches in late 2015 were people from faith communities. 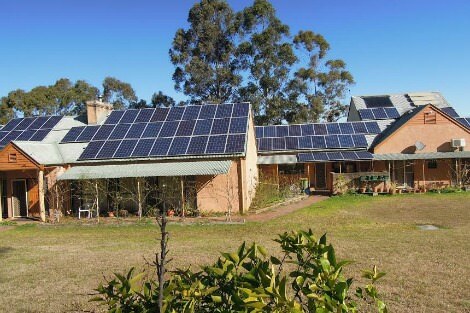 Less encouraging were the results of the Australian National Christian Life Survey in 2011, where the percentages of parishes which had switched to green power or installed solar panels were each well under ten per cent. It is hoped that the results of the 2016 survey will reflect a marked increase in rooftop solar installed in parishes of various denominations and by Catholic schools. One exemplary development is the roll-out of solar installations across all Catholic schools in the Diocese of Townsville. To be honest, however, the Big Church Switch is so exciting because we're nowhere near it here. The majority of faith-based organisations continue to have investments in fossil fuel extraction and it remains a minority of them which are using clean energy. It is unusual in many parishes to hear any mention of global warming at all, much less what might be done about it. Our religious leaders rarely speak out about the governments' comparatively weak policies to address climate change, nor do they direct significant resources to environmental work. Only a handful of people are employed by faith-based organisations to exclusively work on environmental advocacy. Most often, creation care is just one area of responsibility of overloaded staff working on various social justice issues, and it tends to be perceived as less urgent. The employment of sustainability officers in faith-based organisations appears to be becoming more common, but even this is not yet mainstream. Long before green encyclical Laudato Si [Indeed before 2013 conclave]: The Vatican, the world's smallest state, had reportedly become the most ecological, according to l'Osservatore Romano, the official daily newspaper of Vatican City. The Vatican City State has installed 2,400 solar panels on the Nervi Hall roof, measuring over 5,000 square metres. This will reduce CO2 emissions by 225 tonnes per year. As well, the Vatican has established its own small record in production of solar power per inhabitant, with close to 200 W at peak times. The Vatican City State has a population of only 800 inhabitants on a surface area of 44 hectares (10,000 square metres per hectare). Along with solar power, the Vatican wants to invest in wind and biomass energy in the coming years. It has previously been involved in ecological matters, having invested in planting a forest in Hungary in 2007. Beginning in 2008, the Vatican has been implementing an ecological development program, seeking to become the first European state to fulfill 20 per cent of its energy needs using renewable energy by 2020. Our parishes have switched to a power provider that uses water to generate most of the electricity. Sadly, we can't put solar panels on the roof of our churches and presbytery yet as they are heritage buildings and we are prevented from doing so by the heritage rules. I've thought about panels on a separate stand in the yard and will investigate this further. Thanks for that useful contribution to the debate that is so ponderous! The challenge is for us as Christian churches to at least emulate our British cousins. Thank you so much for setting this encouraging and enlivening example before us. How wonderful if the Australian Church could do anything near the same. Diamond Energy here is an alternative provider which invests in alternative energy unlike the Big Three main providers. Such a clear and surely not such a difficult way to make a positive change in the environment. Thanks Thea for an insightful article. Hopefully this will inspirt the Australian Church Bishops, Deans, Muftis and other Church leaders to QUICKLY mandate a Big Church Switch to Renewable Energy in all their Parishes and communities. TIME IS OF THE ESSENCE! Thanks very much for your article, Thea! I am wondering if now, at least in South Australia, we have a better option. Rather than all putting up solar panels (which only produce electricity when the sun shines), we could increase our efforts to lobby the State and Federal Governments to invest in solar thermal energy production. This is very likely to become a reality in Port Augusta, which will mean reliable electricity that feeds into the grid at any time of the day or night. Of course, churches might only need their electricity during the day, but we all need to tap into the grid if we want power at other times. If the entire state electricity system, or a substantial part of it, could be produce via renewable means, then surely that is a benefit for everyone! South Australia is already at about 40% and I believe we could be 100% renewable if the right projects are funded.